Rebel is a Students’ Union Radio Station based at Essex University in Colchester, UK. It is run by and for the students, offering debate, education, information and entertainment to over 12,000 listeners. It is housed in the Creative Studios, a new section of the University opened in October 2015, which consists of a News Room, TV Studio, Editing Suite and two Radio Studios. The studios are equipped with top of the range audio equipment and software that powers both the radio and TV studios. The two radio studios each use a bespoke Sonifex S2 mixer package with Studio 1 focussing on live On-air duties and Studio 2 being identical as a back-up but also used to pre-record content for shows, to record podcasts and to manage the playlists. The installation was completed by Paul Miller of Advanced Studio Projects, with Peter Coxell, a former student from 2008-2012, and now Creative Studios Coordinator at Rebel, directing the install and helping out along with colleagues Gemma Brett and Louis Clift. The Sonifex S2 mixer package consisted of the S2 on-air mixer set into quality S2-Solutions technical furniture, in deep solid ash with hard wearing blue/grey linoleum surfaces. 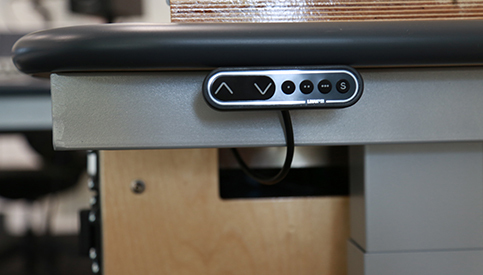 The furniture used an electrical riser system which offers variable desk heights, allowing the students to present and work either standing or sitting at the desk, whilst also providing plenty of access for disabled users. The Sonifex S2 is a modular broadcast mixer which offers digital audio quality with analogue reliability in a modular format. It has both digital and analogue input channels, together with simultaneous analogue and digital outputs. The Sonifex S2-Solution furniture is modular, so it can be used for a small L-shaped production or talks studio, through to a larger U-shaped on-air studio. It’s easy to fit together with large internal spaces for cable routing, so from every angle, the furniture looks neat, orderly and professional. If additions, or modifications are needed, bespoke woodwork can be produced to your design which can integrate with standard furniture to save costs.